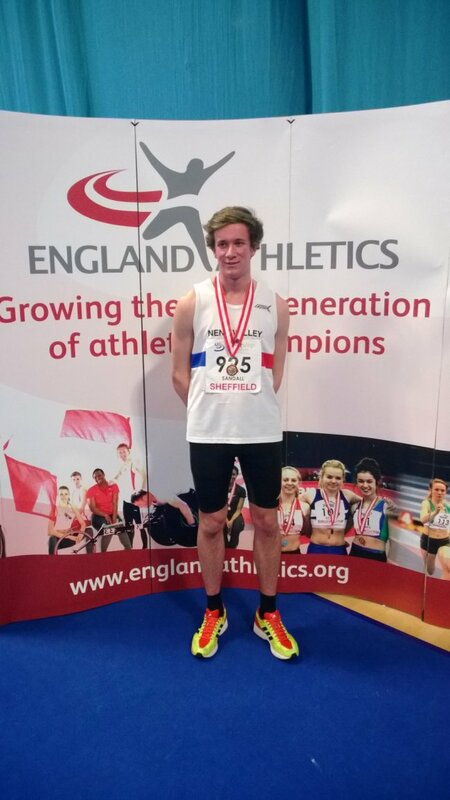 Ashley Sandall takes England Athletics under 17 400m title with club record and UK top time. "I raced at the national championships this weekend and was very pleased with my performance overall! I won my heat with comfort in a time of 50.75 seconds. I later ran the semi-final and took 1st place again with a time of 49.78 seconds, which I was very happy with because this was a comfortable sub50 for me. I then raced the final the following day and I was delighted with how I performed, running a personal best time of 49.14 seconds to take the national championship title over 400m. I am also still uk no.1 and I aim to train hard for the outdoor season." Kane Wright competing in the under 20 men's 60m qualified for the semi-final with a time 7.13 marginally short of his personal best. he then repeated the feat in the semi-final running a consistent time of 7.15 but failing to make the final spots. Jasmine Allen and Alex Pullan competed in the under 15 girls 60m. Jasmine, a first year under 15 had an extremely tough heat with the UK number 1, the Welsh Champion and the Surrey County Champion. Her fourth place finish with a time of 8.42 which was marginally short of the 22 year old club record. Alex ran her heat just as well and was also in the mix with a time of 8.48, a personal best. This suggests a strong track team for the NVH girls! The other NVH competitor was Maria Hollingsworth in the under 20 ladies 60m hurdles. Maria ran well after a poor start finishing 5th in her heat with a creditable 9.04s. Nathan Pickering competed in the Chelmsford Indoor open on Saturday and recorded a personal best time 7.80 for the 60m finishing second under 15 boy.